2. In a medium bowl, stir the flour, sugar, baking powder, baking soda, and salt together with a fork. 3. Add the cold butter pieces and, using your fingertips, work the butter into the dry ingredients until the mixture resembles course cornmeal. It’s OK if some large pieces of butter remain – they’ll add to the flakiness! 4. Add the blueberries and mix with fork until just combined. 5. Add the 1/2 cup buttermilk, 1/2 cup ricotta, lemon zest and mix with fork until the ingredients are just moistened – the dough will look rough. If you feel like the dough is dry, add more buttermilk one tablespoon at a time. 6. Gather the dough into a ball, pressing it gently so it holds together, turn it out onto a lightly floured surface and knead lightly – about 12 times. 7. Cut the dough in half. Roll one piece of the dough out to a circle about 1/2″ – 3/4″ thick and about 7 inches in diameter. 8. Brush the dough with a healthy helping of the melted butter, dust with 2 tablespoons of the sugar and cut the dough with a pizza cutter or a sharp knife into as many triangles as you like. 9. I like to cut the dough halfway vertically and halfway horizontally to make four large pieces. Then I cut one line diagonally on the left and another on the right. That makes about 8 triangles. If you want your scones to be larger, cut less triangles. 10. 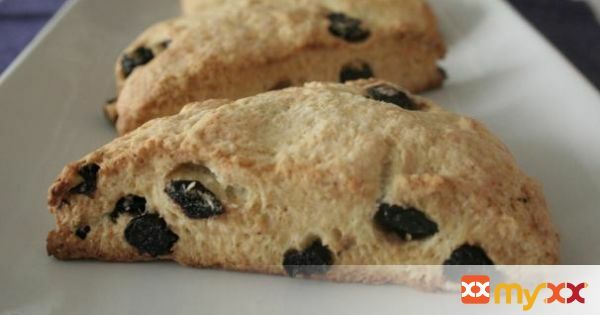 Place the scones on a baking sheet and set aside while you roll out the rest of the dough. Repeat steps. 11. Bake the scones for 12 – 15 minutes until the they are golden on the top and bottom. Transfer to a cooling rack and cool slightly. They are best served warm. 12. If you’re not eating the scones the same day or the next, wrap them airtight and freeze. They’ll stay fresh for a month. 13. To serve, defrost the scones at room temperature in their wrappers, then unwrap and reheat on a baking sheet for 5 minutes in a 350 degree oven. 14. These are at their best served warm with butter and raspberry or mixed berry jam. Fruit preserves work well too.